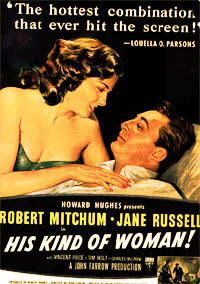 Here's how one blogger reviewed the 1951 noir potboiler, His Kind of Woman (which stars Jane Russell). So... yeah, toward the end Vincent Price goes nuts and starts killing people... he goes nuts in a comedic way spouting actor-y Shakespeare lines while discovering vitality in being a man, but I chose to see it as somewhat more sinister. He just cracks and finds out that he enjoys killing. It's awesome. He also says stuff like "this is man's work, women are for weeping!" And here's my other blog post about Jane Russell and Howard Hughes.